An important center for Buddhist learning, Nagarjunakonda, is located on the banks of the riverNagarjunakonda Krishna at about 65 kms from Vijaywada and 150 kms from Hyderabad in the state of Andhra Pradesh. The place was earlier known as Vijayapuri the capital of Ikshvaku Kingdom. 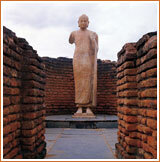 Nagarjunakonda was one of the main Buddhist centers of India from 2nd century B.C until the third century A.D. It is believed that great Buddhist scholar and founder father of Mahayana Buddhism, Nagarjuna founded the University here. The place was a great place for worship by Monks and scholars. The place is named after him Nagarjuna and Konda means Hill in Telgu. Nagarjunakonda was a marvelous city of stupas, chaityas, monasteries, and impressive structure adoring them. The city had a large amphitheatre with ideal acoustics, royal baths, and harbors and bathing ghats along the river, an altar to sacrifice horses and a fine designed drainage system. The excavations have also unearthed someoutstanding memorial pillars, jewelry, coins, statues and some impressive white marble excellent sculptures of Buddha, depicting the life of Lord Buddha. All the excavated items are now housed in the Museum on the island. It also features a statue of Buddha which is 10ft high. The Great stupa, Mahachaitya, contains the sacred relics of the Buddha- an earring and a small tooth. The large stupa is decorated with a large garland-ornament. The stupa is 18 meters in height and measure 32.3 meters in diameter and 4 meters width. TheNagarjunakonda stupa had a circular central column, with eight radial walls gathering a peripheral circular wall, thus creating the appearance in the sketch of a cart wheel with its hub, spokes and felly. The Nagarjunakonda is a captivating place to be as even at sky-scraping noon it offers a 360 viewof the surrounding lake circled by forest covered hills. A visit to Nagarjunakonda is fascinating as it takes you to that launch ride of Nagarjuna Sagar Dam. By Air : Nearest airport is at Vijaywada, which is 65 kms away, and Hyderabad, which is 150 kms from here. By Train : Guntur is the nearest railway station, which is 36 kms, and another railway station is in vijaywada, which is 82 kmsaway. By Road : Nagarjunakonda is well connected by road to other cities. Regular buses ply to all the pilgrimage spots. 150 kms from Hyderabad, 36 kms from Guntur and 82 kms from Vijay Wada. Taxis are also easily available.